These fantastic chairs and table sets are used every day in Coffee Shops, Tea Shops, Caf&###xE9;s, Restaurants, Pubs, Hotels and B+B's and, of course, thousands of homes up and down the country. They are made of solid wood, NOT veneer, and have a lovely grain and rich colour (roughly akin to medium or light Oak), with the odd knot here and there adding to the overall effect. &###xA0;They are made from RUBBERWOOD, which is a hardwood that is part of the MAPLE family (see below). Our customer service is second to none with direct access to us to sort out any problems - no large call centres here! So any problems, questions or queries please don't hesitate to call, we'd love to hear from you! Tables and chairs are supplied flat-pack for simple assembly. Seat width is 430mm, seat depth is 430mm, seat height is 465mm, seat thickness is 19mm. Table size is 700 x 700mm and is 750mm high. 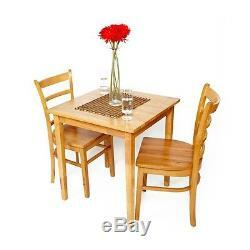 700 x 1140mm tables are also available, as well as Lancaster chairs - please see our other listings. Bulk orders will be sent out by pallet at a cost of &###xA3;85 per pallet (area restrictions &###xA0;still apply). Each pallet can take approximately 12 large tables and 60 chairs. If in doubt about anything please see our superb feedback or give us a call on 020 888 54321. All prices included VAT and a VAT invoice will be issued on request. Rubberwood is a hardwood from the maple family of woods. It has very little tendancy to warp or crack and is one of the most durable timbers used in furniture manufacture - it is much stronger than pine. As a member of the maple family, rubberwood has a dense grain making it very strong. Like maple, rubberwood is a sap producing species, but instead of producing sap it produces latex. Rubberwood trees&###xA0;produce all the latex used for rubber based products. Rubberwood is the most ecologically "friendly" timber, as it is grown specifically&###xA0;for latex production. After the latex production in an individual tree begins to dry up, the trees are chopped down. Our furniture is made from what is esentially a "waste" material. The item "Coffee bar Cafe Bistro Dining Restaurant Tea shop Table and Chair set (Coco)" is in sale since Tuesday, April 29, 2014. This item is in the category "Business, Office & Industrial\Restaurant & Catering\Furniture/ Décor". The seller is "barrcon" and is located in London N15. This item can be shipped to United Kingdom.